Editable royalty-free map of Norway in vector-graphic online store. 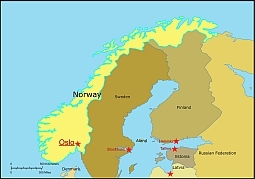 NORWAY LIES ALONG the western coast of Scandinavia. It is a long country, narrow in its northern half and only 50 miles (80 km) wide at one point. Despite its northerly location, Norway’s lengthy coastline is kept free of ice by the warm Gulf Stream. Most of the country is mountainous, with spectacular landscapes of thousands of lakes and offshore islands.Many people work in industry, including offshore oil and gas production, shipbuilding, and mining. Fishing, forestry, and agriculture employ only about five percent of the total workforce.